Former Southeastern Conference commissioner Mike Slive, motivated by his own personal journey from diagnosis to remission, wants to help others beat prostate cancer. 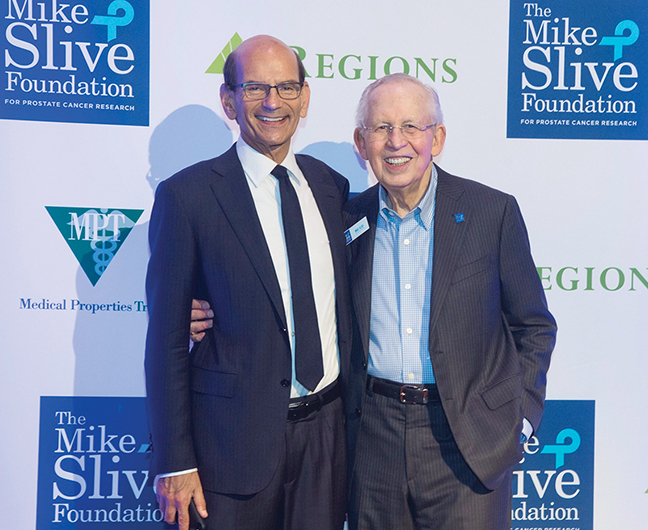 On Sept. 14, during Prostate Cancer Awareness Month, The Mike Slive Foundation for Prostate Cancer Research officially launched in Birmingham. The mission of the foundation is simple — saving lives by funding cutting-edge prostate cancer research. Prostate cancer follows only skin cancer as the leading cancer among men and it is the second leading cause of death from cancer in men. Typically occurring in older men, prostate cancer will be diagnosed in approximately 1 of every 7 men. Despite being one of the most common types of cancer, prostate cancer receives the least funding per new case. Slive and attorney Ed Meyerson, both involved members of the Birmingham Jewish community, started the foundation earlier this year. Paul Finebaum of the SEC Network emceed the kickoff event. Slive retired in 2015 after serving as SEC commissioner since 2002. He was first diagnosed in 1996 and had his prostate removed. He had treatments in 2001 and 2006 after tests showed elevated PSA levels. In 2014, after he suffered extreme pain in his abdomen, a tumor was found on is spine, squeezing his spinal cord. He had surgery the next day, then a long protocol of radiation and chemo treatments, along with rods placed in his spine. His cancer is currently in remission and he is living a normal life. Meyerson has been involved in this battle for years. Fifty years ago, his father was diagnosed with an aggressive case of prostate cancer when he was in his 60s. The treatments done then would not be done today, and though he lived into his 90s, his quality of life was greatly diminished. Meyerson started supporting the UAB Comprehensive Cancer center 28 years ago. “When I saw that we were making such strides through the Breast Cancer Research Foundation at UAB, that was my impetus to start the Prostate Cancer Research Foundation of Alabama, which has become the Mike Slive Foundation,” he said. Slive recommends that men of a certain age determined by their doctors get a PSA screening. “Prostate cancer is asymptomatic. You may have the symptoms and not feel it. When the pain hits it is already too late,” he said. Slive said since college football is so big in the South, they plan to use that and the conference he formerly led as visibility platforms to plead for more support in the fight against prostate cancer. “That is a great way for to raise awareness since many of the people we want to reach are football fans,” he said.